New centre will provide a location for Deck, Engineering and other Oral Examinations for the maritime community. 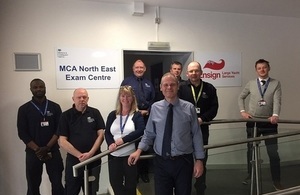 The Maritime and Coastguard Agency (MCA) has officially opened the new North East Exam Centre, which is based at South Tyneside College. The centre will provide a location for Deck, Engineering and other Oral Examinations for the maritime community. Speaking at the opening, Katy Ware, Director of Maritime Safety and Standards at the MCA said: ‘The Marine School at South Tyneside College is a world-renowned centre of excellence for marine education and training, and so we are delighted that the college is now also home to this new exam centre, the first of its kind in the UK.